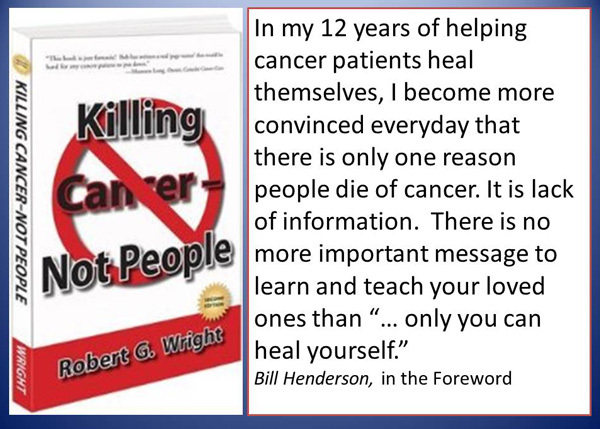 HomeCANCER STORY: Success & Hard TruthNo chemo or radiation for me! CT scan was done the next day. 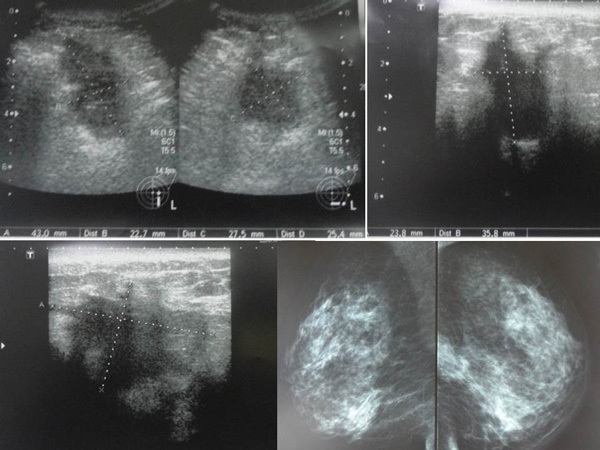 The result confirmed the presence of a 4.87 x 3.06 cm mass in the left breast with enlarged left axillary lymph nodes. 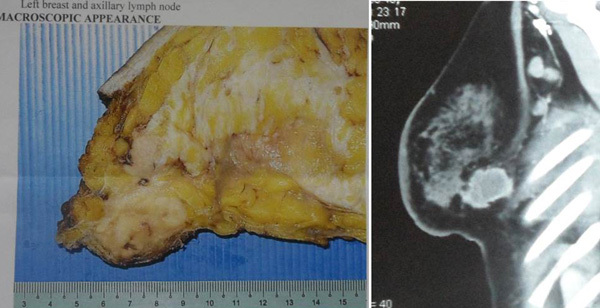 These are suggestive of left breast malignant lesion with lymph nodes metastasis. On 2 May 2013, WC underwent a mastectomy. Histology confirmed an infiltrating ductal carcinoma, grade 3, pT3. Three of eight nodes examined are involved with tumour. Surgical margins are not involved. Five of nine nodes axillary nodes are involved with tumour. The tumour is negative for both estrogen and progesterone receptors. WC was asked to undergo 6 cycles of chemotherapy costing about RM 17,000. In addition she had to undergo 21 times radiation treatment. In preparation for chemotherapy, WC was asked to install a chemo-port which cost RM 3,500. WC declined this. But WC was facing a huge dilemma. Two of her friends also had breast cancer. They saw the same doctor at the same hospital as she. Both of them had undergone the same treatments which she was asked to undergo. Both of them had died of the treatment. WC knew then that the treatment which she was asked to undergo would not cure her. The daughter was very much against her undergoing this medical treatment. WC had already paid RM 9,000 as deposit for her radiotherapy. WC’s daughter came to know about CA Care and came to seek our help. She told us that her mother was due to start her radiation treatment the next day but after talking to us, she decided to forgo the treatment. Based on her medical reports, we prescribed WC Capsule A, C and D, C-tea and Breast M. In view of her lymph node involvement she was also asked to take Lympho 1 and 2. On 31 May 2013, WC, her husband and daughter came to see us again. WC had started to take the herbs without any problem. During this first encounter with WC, I explained to her that based on the report, the cancer had already spread to her lymph nodes. She is at a greater risk compared to others. Why is that that she refused to undergo medical treatment since she had already paid a deposit of RM 9,000? In fact, the hospital refunded her only RM 2,500 for defaulting. Listen to what WC has got to say. Chris: Your condition is risky. But are you happy with what you want to do? C: Why don’t you want to go for radiation and chemotherapy? WC: Two of my friends died. They had breast cancer, went to the same doctor at the same hospital. They did chemo and radiotherapy and they died. I am so afraid. My daughter told me not to go for the medical treatment. If I have to spend money and then I die, I prefer not to do any treatment. Why spend money, suffer and then die? C: Are these people your friends? WC: Yes, my own friends. I saw them. They did everything and they were not cured. So why should I spend money and suffer. C: Let me ask you. If you do the treatment and you die. If you don’t do the treatment and you die. Which one do you prefer? WC: I say do nothing is better. In the case of one of my friends, the cancer had spread to her bones. In the other, the cancer went to her brain. Doctors don’t tell you all these. They only ask you to do the treatment. They say the treatment is good for you. C: Don’t you believe them? WC: I was not sure and did not know what to do. My daughter told me not to go for the treatment. C: Did you ask if the treatment was going to cure you? WC: No, I was afraid to ask that. He would scold me for that. When I did not go for the treatment the doctor even called me at home and asked me to come for treatment. He said I must do the treatment. Husband: I asked and the doctor said he could not give any guarantee. C: Relax. Take it easy. Perhaps doing nothing could be a better option for you. You have to learn how to take care of yourself. Take care of your diet. Then exercise. And then don’t think too much after that. WC: Okay. My children are all grown up. I don’t have to worry anymore. C: That’s a very good attitude. For sixteen years, since we started CA Care, we too were trying our best to educate people – providing them with information which we thought they need to know. Some people seemed to benefit from our efforts. After reading what we wrote we practise what they know! But for some others, after reading they feel educated but they shy away from doing something for themselves. They prefer to let the “experts” tell them what to do.